Shrouded by a dark cloth and sitting atop the Bristol Motor Speedway media center desk sat a big mystery. But when Speedway Motorsports’ Marcus Smith and Greg Walker revealed the what was underneath the mystery shroud, it revealed a stunning three-foot-tall trophy made of acrylic and metal and featuring iconic images known to Charlotte residents and racing fans was revealed to the media at Bristol Motor Speedway for the very first time on Saturday afternoon. The trophy will be presented to the winner of the inaugural Sept. 30 Bank of America ROVAL™ 400 at Charlotte Motor Speedway. The trophy was designed by Stephen Gould. The unique trophy weighs approximately 60 pounds and required 70 hours of work to produce. Featuring a floating outline of the first-of-its-kind ROVAL™ track as well as a replica of the top of Charlotte’s iconic Bank of America Corporate Center – as a nod to the sponsor of the first road course race in the Monster Energy NASCAR Cup Series Playoffs. The 17-turn, 2.28-mile ROVAL™ road course oval is the newest track in NASCAR’s premier series and the first to debut since Kentucky Speedway in 2011. 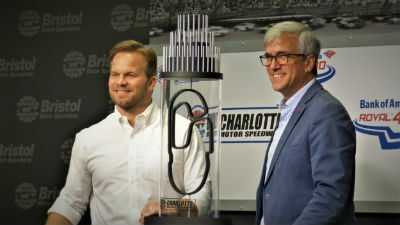 “There can only be one winner of the inaugural Bank of America ROVAL™ 400, so we’re going to see some all-out battles to decide who will claim this special trophy,” said Greg Walter, the executive vice president of Charlotte Motor Speedway. Smith and Walker also revealed continuing efforts to get the track ready for the one of a kind event, including the construction of an infield pedestrian bridge and the installation of synthetic turf on the front stretch of the famed track. In addition to the trophy reveal, Smith and Walker announced that the track will host a concert featuring the Red Rocker himself, former Van Halen frontman and solo performer Sammy Hagar. Purchase of the ROVAL race tickets also include the Sammy Hagar concert.